The Milwaukee 2472-20 simplifies cable cutting with the one cordless tool that fits comfortably in crowded panels and generates 5,000 lbs. of force. With an open jaw, breakthrough powered ratcheting mechanism and superior blade geometry, the 600 MCM Cable Cutter fits into tight spaces and cuts effortlessly through large-diameter cable, leaving a clean, installation-ready cut. The compact size and scissor-style jaws enable cutting in crowded panels without looping, ratcheting or long arms. Ideal for electricians, datacomm, utility or service contractors or demolition crews, this cable cutter with 2-speed gear case delivers the power needed to cut large-diameter cable and then switches into high speed to slice quickly through a variety of smaller and more common wire types. Powered by the revolutionary 12-volt Red lithium Battery (sold separately), this new cable cutter can deliver up to 150 cuts of 500 MCM copper per charge. A built-in LED light illuminates the line of cut. Evolution ft.s Electric Disc Cutter easily cuts Concrete, Stone, Brick, and Paving, even reinforced concrete, with the supplied 12 inch. diamond blade. The powerful 15Amp / 1800W motor makes easy work of the most robust materials and because it is electric there are no harmful fumes, making it ideal for work in enclosed areas. The ergonomic support handles are ideally positioned for perfect balance when cutting and the spindle lock mechanism means blade replacement is quick and simple. The M12 M-SPECTOR FLEX 9 ft. Inspection Camera Cable Kit is the only contractor inspection camera that gives users the ability to see more, easier, faster. The kit's 9 ft. cable gives users extended reach in pipes and air ducts without the hassle of buying and connecting additional bulky, inflexible extensions. Leveraging state-of-the-art LED technology, users get 15X greater LED brightness for seeing further and clearer in large, dark spaces. The 12.5mm (.49 inch) diameter and shortened camera head length gives users easier and greater access to tight spaces than 17mm cameras. A 3.5 inch wireless LCD display console allows users to comfortably view images in any position. Capture best-in-class images or video on an SD card for easy documentation of warranty claims or service work for customers. The M12 M-SPECTOR FLEX 9 ft. Inspection Camera Cable Kit is perfect for plumbing lines, H/VAC, facility maintenance, and trades where documenting inspections is essential. The M12 Drain Snake is the ultimate service plumbing solution for tough jobs through 2-1/2" drain lines; and weighing only 10 lbs., it's the lightest professional drain cleaner on the market. It's unique, hybrid design provides the benefits of both handheld and floor based drain cleaners in one machine. The tool's fixed drum shield with flat base protects users and fixtures while providing maximum tool support for easy cable feed. Plumbers, Facility Maintenance, and Property Managers will eliminate setup time when they switch from their corded drain cleaning machines to the M12 Drain Snake. Powered by REDLITHIUM Battery Pack which delivers more work per charge and more work over pack life than the competitors. REDLINK Intelligence provides optimized performance and overload protection against abusive situations. 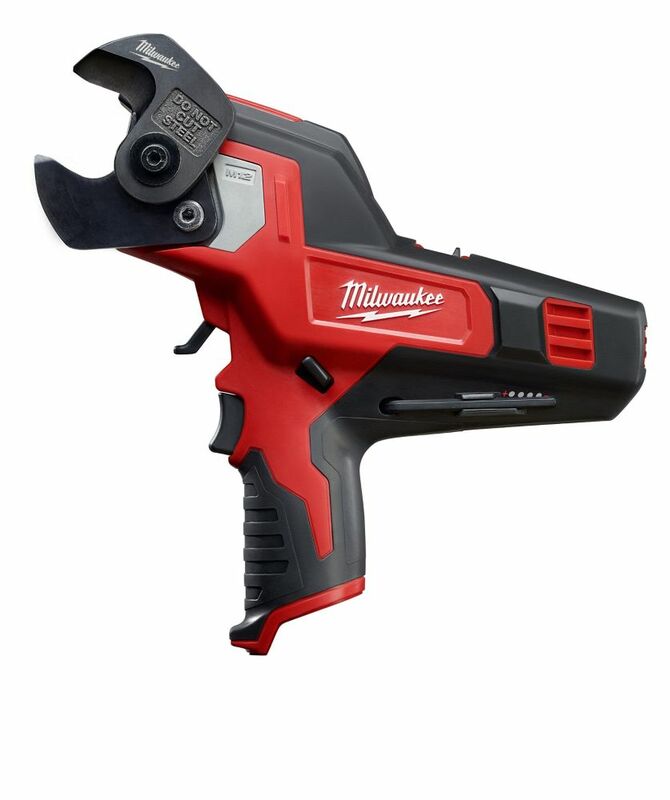 M12 12-Volt Lithium-Ion Cordless 600 MCM Cable Cutter (Tool-Only) The Milwaukee 2472-20 simplifies cable cutting with the one cordless tool that fits comfortably in crowded panels and generates 5,000 lbs. of force. With an open jaw, breakthrough powered ratcheting mechanism and superior blade geometry, the 600 MCM Cable Cutter fits into tight spaces and cuts effortlessly through large-diameter cable, leaving a clean, installation-ready cut. The compact size and scissor-style jaws enable cutting in crowded panels without looping, ratcheting or long arms. Ideal for electricians, datacomm, utility or service contractors or demolition crews, this cable cutter with 2-speed gear case delivers the power needed to cut large-diameter cable and then switches into high speed to slice quickly through a variety of smaller and more common wire types. Powered by the revolutionary 12-volt Red lithium Battery (sold separately), this new cable cutter can deliver up to 150 cuts of 500 MCM copper per charge. A built-in LED light illuminates the line of cut. M12 12-Volt Lithium-Ion Cordless 600 MCM Cable Cutter (Tool-Only) is rated 4.6 out of 5 by 23. Rated 5 out of 5 by Christian from Makes cutting wire easy.... Makes cutting wire easy. Rated 4 out of 5 by Nieko from Works great!! The only thing it needs is some how to hang it and maybe in the m18. Works great!! The only thing it needs is some how to hang it and maybe in the m18. Rated 5 out of 5 by Jim G from electrican This one tool saves more time and mussels then you can only imagine!